This series is designed to introduce you to the world of music. It is not intended as a music appreciation series for the non-musician, but rather it is intended for those who want to be musicians or want to improve their musicianship. It could be that you’ve never played an instrument or sung before and would like to. Perhaps you learned to play or sing by rote, that is, you copied what you heard and saw but don’t really understand why or what you are doing. Perhaps you’ve reached a point where you just aren’t improving as a musician. Hopefully this series can help all of you. There is much in the way of theory and how to read music in this series. If you want to learn to play or sing by ear or in a way that results in you only being able to play music someone else has already recorded or that you’ve heard, there is plenty of other material, good or not, that I would point you to. This series isn’t for you, it’s for the person who wants to be a well-rounded musician. It’s for someone who can read music and understand what they are reading and performing. If you want to be able to play or sing any music, even music you’ve never heard, and do more than just play notes, actually make music, then you absolutely must learn to read music notation and you need to understand why those notes are there in the way they are there. In other words, learn the theory behind the music. That’s what the series is for. I want you to be more than someone who just copies what they’ve heard. I want you to be a well-rounded musician. This series is a very small step in the long process required to be a good musician. If you are a musician, each instrument – singers, the body is your instrument – has different techniques necessary to play that instrument. String players have to learn how to bow properly. Guitar players need to learn finger positions. Brass and woodwind players need to learn breathing. Singers need to learn diction. Keyboard players need to use proper hand technique, etc. You can learn much on your own in this department, but the best players, even if they say they are self-taught, have had someone at some point in their career show them the technique of their instrument. A teacher is highly recommended. This series will not discuss technique or how to play an instrument. For all the examples shown, you can click on the picture to see a bigger version. Next time, we look at basic notation. I’ve uploaded a video showing three iPad apps that I find useful as supplemental material when teaching my piano students. When I downloaded them, they were all free apps. QF Notes is a basic Notation Flash Card program. Plain and simple. Pitch Invasion is a PG Music app for Ear Training. For kids, but adults will more than tolerate it. The aliens play a note and you have to guess it before the alien captures one of the instruments along the bottom row. Various levels of difficulty. Finally, one definitely designed for kids, but a few of my beginning adult piano students have found it to be challenging enough to keep them playing it. The short link for the video. A reminder that if you are looking for some unique sheet music, visit the website and download, for free, any of the over 400 sheet music titles we have available. 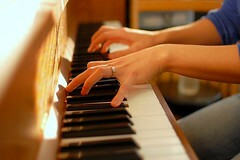 For a limited time, I’m offering free music tutoring and piano lessons via the internet. Read more. I’d love to hear from you about the blog, YouTube, my sheet music, my recordings on iTunes, GooglePlay, CD Baby or Amazon, even if it’s a negative comment. After considerable difficulty with video cap and editing software, I’ve finally gotten two new videos done. I decided to make an arrangement. I did it in Sibelius 7 and Reaper. The first video shows the process of making the arrangement. This arrangement was for violin, cello, piano, guitar, bass and drums. The 2nd video shows taking the MIDI from Sibelius and putting it into Reaper DAW and making a recording. I welcome your comments and questions, either here or on Youtube.